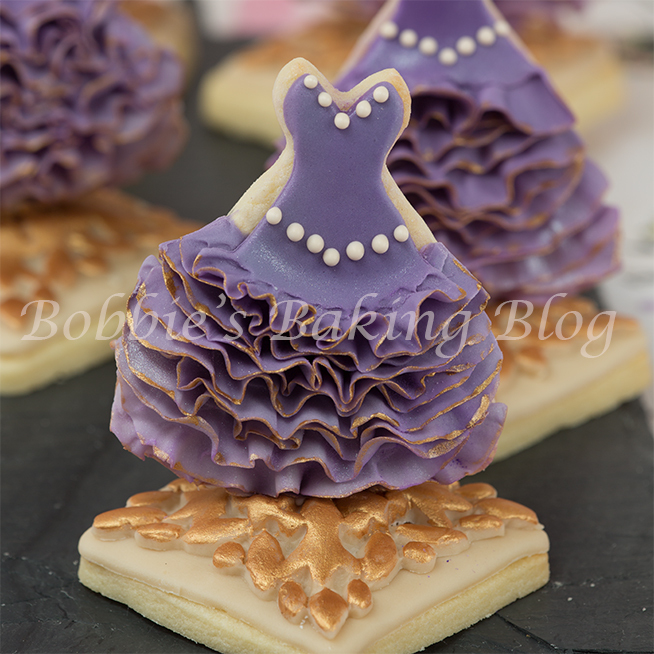 Beautiful frills for sugar cookie worthy of Red Carpet! The 86th Oscars will be held on March 2, 2014 with Ellen DeGeneres hosting. The anticipation for those few minutes the actors/directors et cetra will walk the Red Carpet starts with finding the perfect designer and commission them to create a one of a kind dress. The competition to procure a place of the topped dressed Red Carpet runway list is merciless, and sometimes can be humiliating (especially if actors’ name appears on top worst list or not mentioned at all). In honor of the 86 Oscar I recreated Amy Adams’ dress from the 85th Oscars 2013. She wore a magnificent Oscar de la Renta gown. Strapless, with a fitted corset bodice and an enormous, frilled skirt with a long train, the gown is elegant but in no way understated. Amy’s dress is fashion at it’s finest, from the tight fitted bodice to the amazingly frilly detailing on the skirt. I thought it would be fun to share a tutorial capturing the beauty and elegance of Amy Adams’ dress. With the exception of coulor (her dress was dove grey) I think grasped exquisiteness of look. I changed the colour for a visual effect on the frills! To capture the flow and move of Amy’s dress I use an ombre method. You want to prepare you colours ahead of time starting with the darkest graduating to the lightest. To achieve this effect add start by adding small amounts of wedding white fondant transitioning (adding more white with each step) to your lightest color. 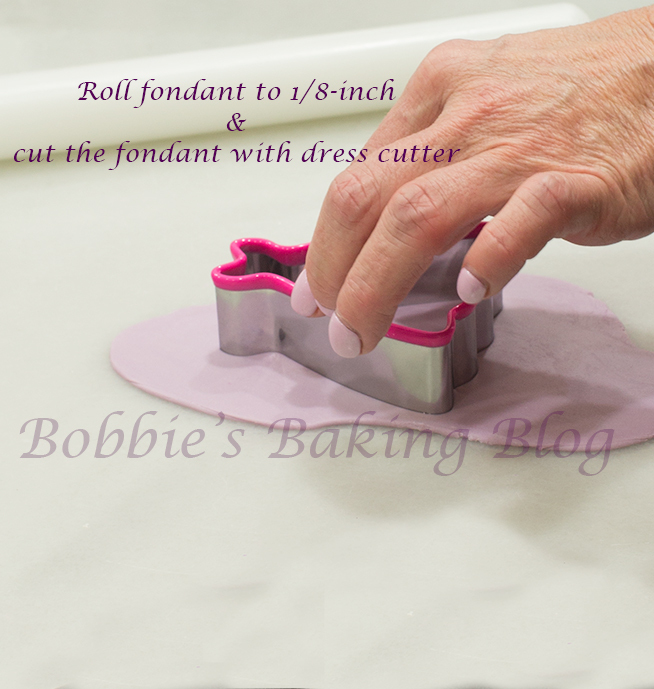 Knead your fondant, roll the fondant to a #1 on a pasta machine or 3 mm/1/8-inch, cut the fondant with your blossom cutter, and with your ribbon cutter, set to the smallest width cut two strips of each color. 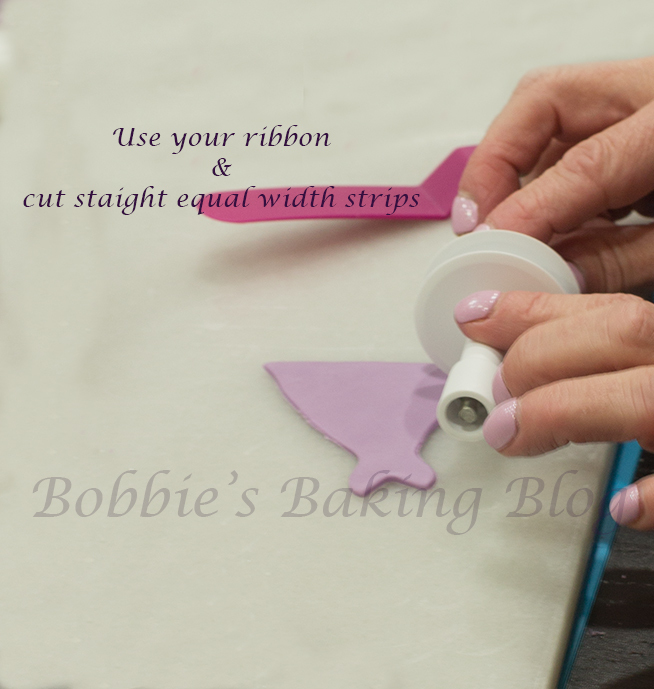 Transfer the fondant strip to your pad and begin to frill the strip, roll the veining tool back and forth until you are satisfied with the frill. Only cut and frill one color at time. 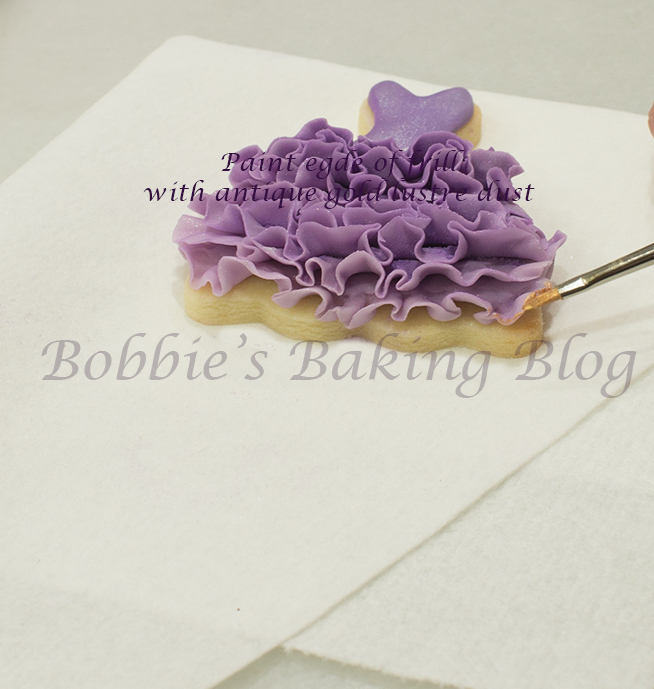 Brush piping gel on the cookies and attach the frilled strip. Work with one ombre color and cookie at a time, we found two strips pre color work brilliantly. Work from the bottom of the dress to the bodice. Attach each strip as close as possible without laying the fondant frill strips on top of one another, each strips should be attached to the cookie. 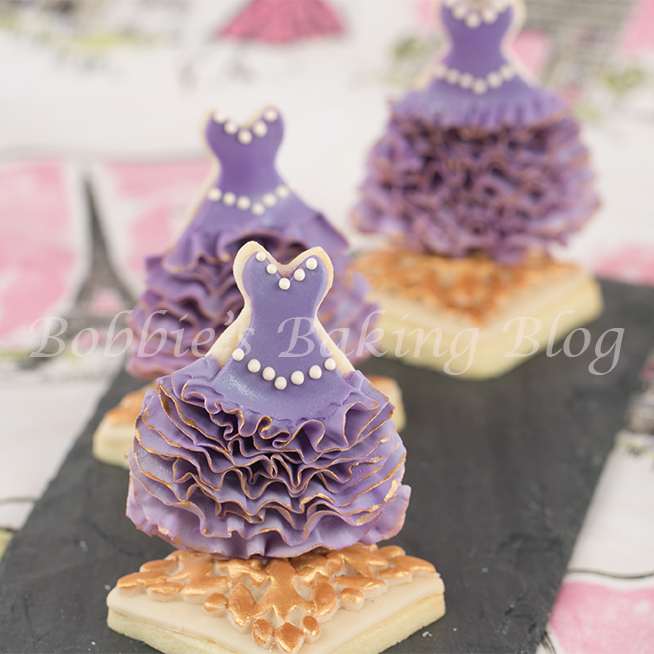 Although the cookie above does not represent Amy’s dress, I wanted to show you another wonderful fashion inspired look with the same cookie! 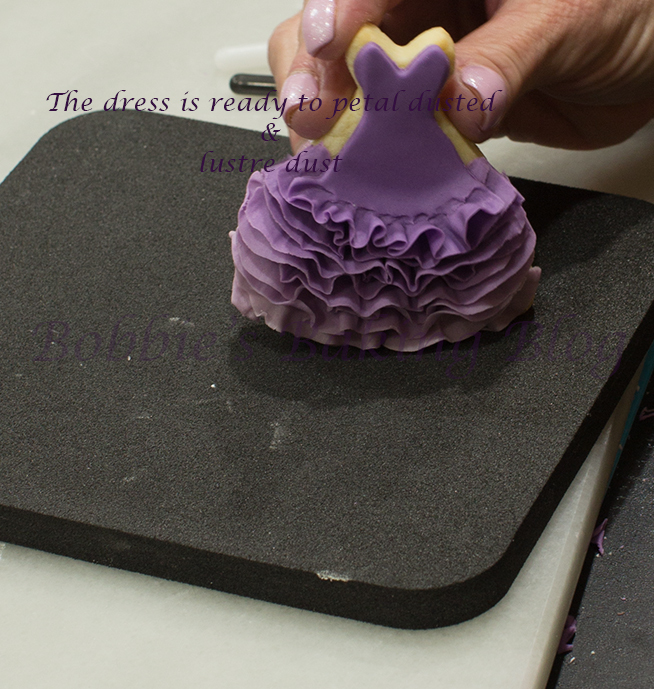 Knead the darkest color of ombre colors, roll the fondant to a #1 on a pasta machine or 3 mm/1/8-inch, cut the fondant with your blossom cutter, and with your mini pizza wheel cutter cut the bodice portion of the dress. Transfer the bodice to a foam pad and use your veining tool to frill the bottom of the bodice. 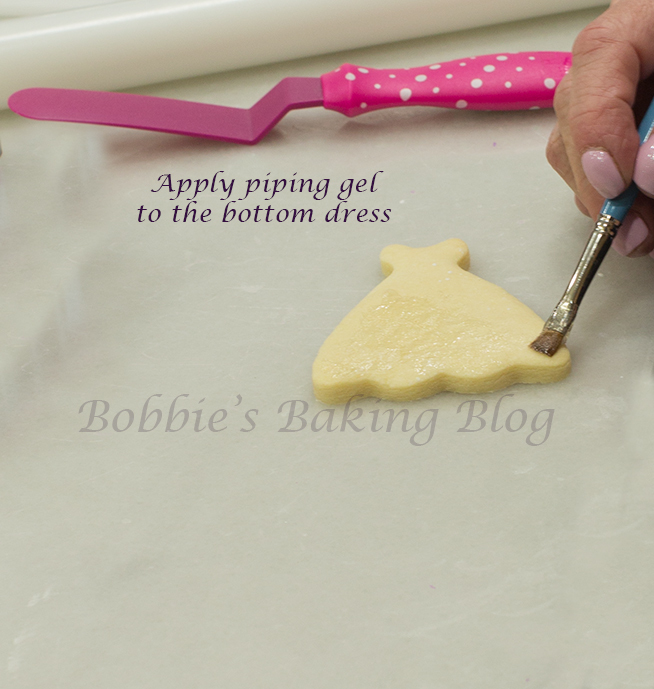 Apply more piping gel to the bodice portion of the cookie and attach the bodice fondant piece to the cookie. Now that your dress is all dressed-up in ruffles, gingerly open the ruffles, starting from the bottom and work your way up to the bodice. Use the blunt end of the Celpin to open the ruffles. 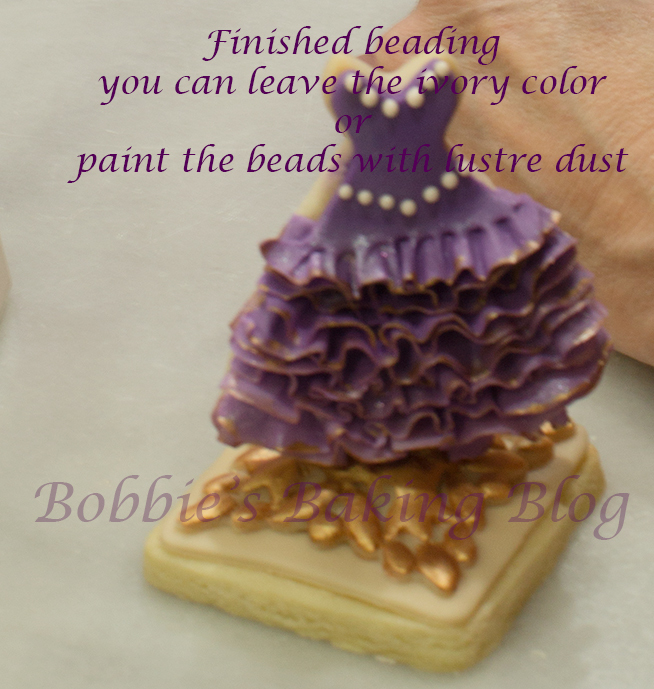 On a piece of parchment paper place African violet and violet, sprinkle cornstarch on the side. 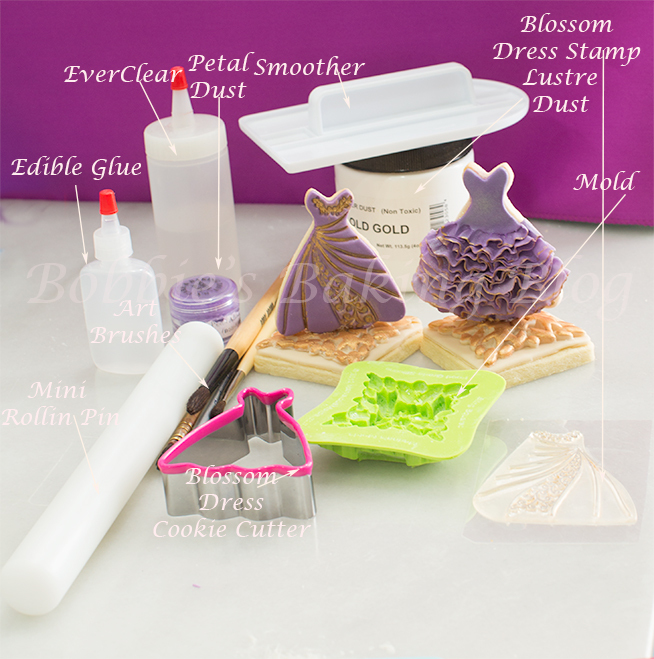 Mix the two violets together and mix cornstarch with an artist brush. 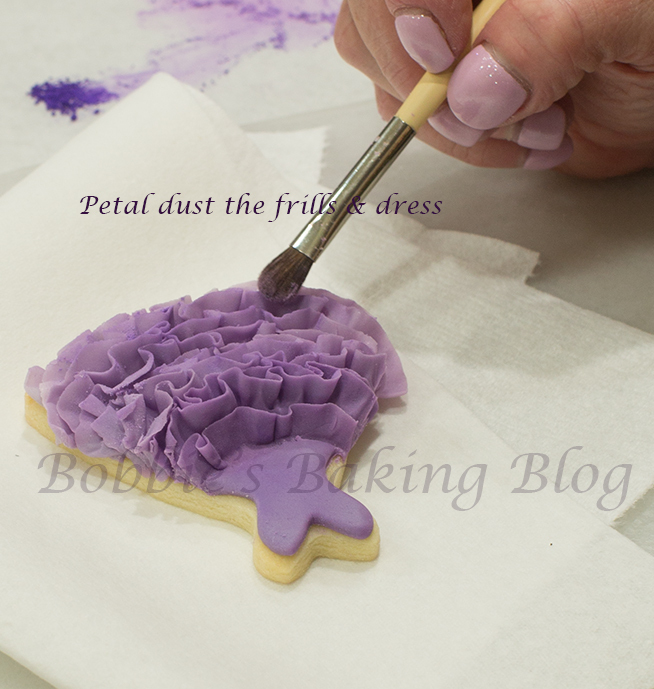 Proceed to brush the petal dust mixture on the ruffles, allowing the excess to fall into the lower ruffles. Petal dust the bodice as well. Mix a few drops of EverClear with old gold petal lustre in a little jar, the mixture should ripple on the bottom for a perfect consistency. With an artist paint brush, only used for food, accent the edges of the ruffles. 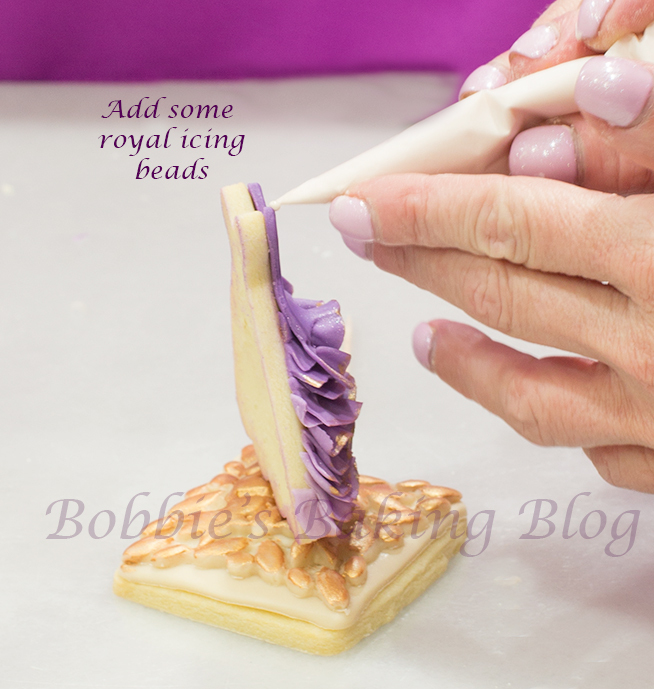 Fill a parchment paper cone with bead consistency ivory coloured royal icing, leaving a small hole. Pipe beads on the neckline and on the bottom of the bodice. 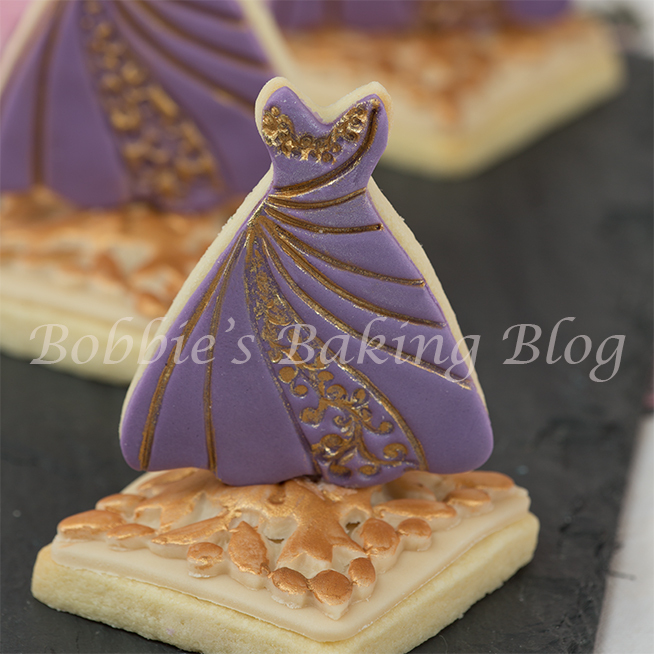 For the stand we used a jeweled mold and a square shaped sugar cookie cover with fondant. Placed a square sheet of fondant in the mold to create the jewel. We painted the jewel with old gold ( I thought it would be apropos for the Oscars). Take the extra pieces of fondant add a few drops of water, at a time, smoosh the mixture with a mini straight spatula until it becomes gooey. 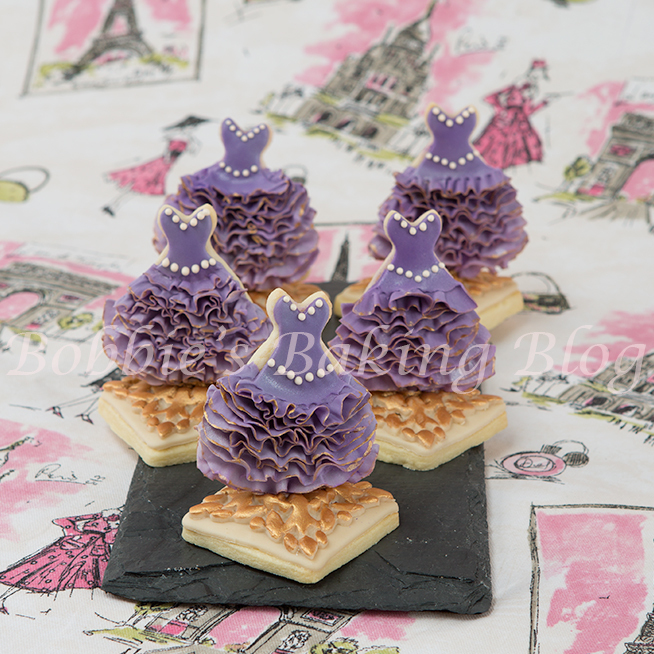 Place the gooey fondant mixture in cornet and apply the fondant glue to the stand and the bottom of the dress cookie, place the two pieces together, and hold for a few seconds or until the dress is standing without aide. If any of the glue peeks out paint it with the old gold/EverClear paint. With million of other viewers I will be watching the Oscars on March 2, 2014 and of course watching the pre Oscar Red Carpet walk! 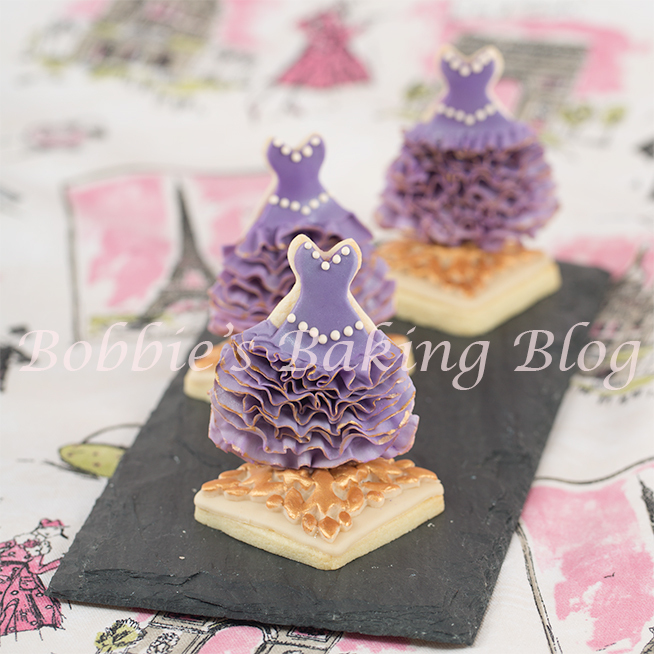 As always I would enjoy seeing your oscar fashion inspired cookies, and with permission put your photo on my FaceBook page (of course credit will be given to you)! A red carpet would have clashed with the frilled dress , instead we have granite carpet! P.S. I am hoping Leonardo DiCaprio takes home the Golden Oscar! These are gorgeous and WAY too pretty to eat. You are incredibly clever. Talk about gilding the lily. I love this! Good color for the dress, too.